Skills: Number Sense, Number Patterns, Sequencing, Counting, Addition, Subtraction. Hop on this oversize (1270mm x 1270mm) wipe-clean version of the familiar hundreds board. Reinforce hundreds concepts, counting, number patterns, place value, operations, problem solving and overall number fact fluency. Focus attention on specific numbers and patterns (such as even and odd) through the use of double–sided, colour–coded number frames. Hip Hoppin' Hundred theme will appeal to many ages. 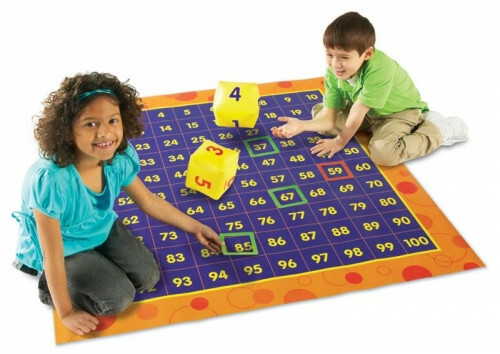 Includes a guide with various games and activities, 54 square number frames and 2 inflatable cubes measuring 130mm x 130mm printed with numerals 1-6.